REHOBOTH "FIRE WORKS" - BUT DO REINOS ??? 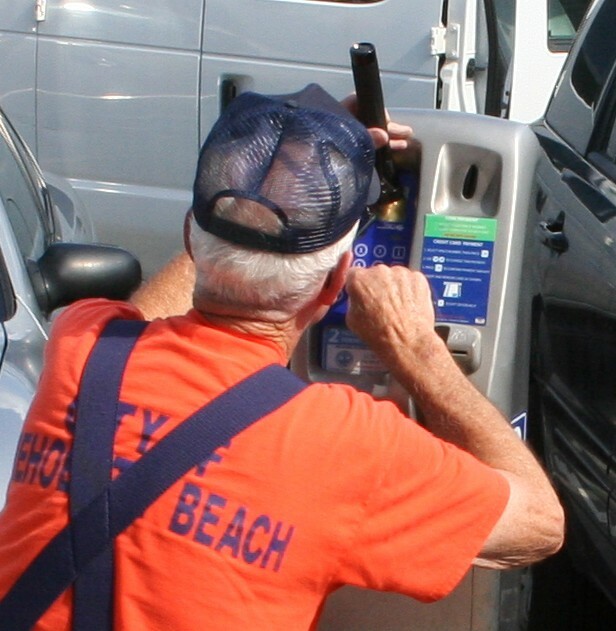 The past week has proven to be challenging for Rehoboth Beach parking meter technicians. 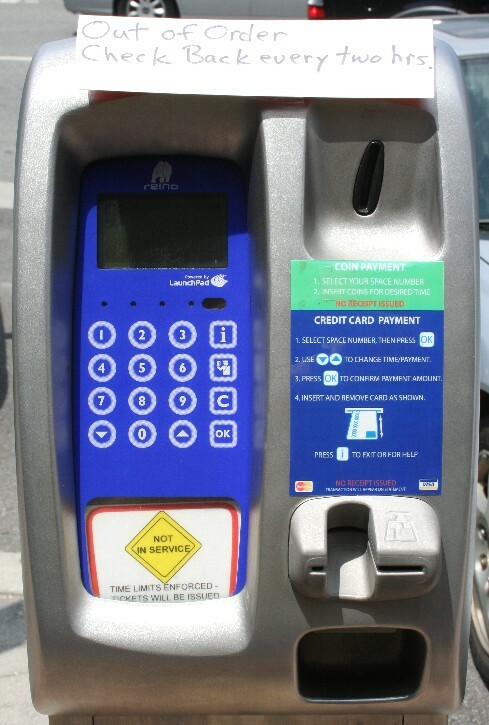 Last weekend many of the city's Reino multiple-space parking meters failed to process credit cards (a few, like the one pictured below, still do not). Some visitors who thought they paid, did not, since the meters failed to display a rejection or confirmation message. On Tuesday, a city official told WBOC-TV the problem was because of an AT&T communications failure (click here to watch Michael Lopardi's report). 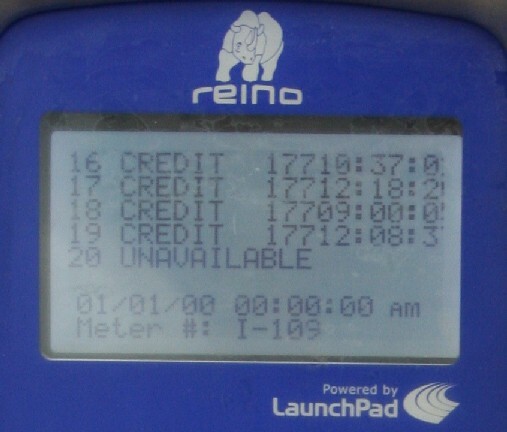 That same day, the city attempted to upgrade the Reino meters to allow them to store credit card numbers and transmit them later in case of another network failure. That's the back-up system mentioned in the WBOC report. During the upgrade period, which lasted in some cases for hours, the Reino meters were unable to accept any form of payment. Meters credited spaces with more than 17,000 hours, which confused many visitors. Some meters were successfully upgraded remotely using the wireless network, while others had to be manually upgraded. One parking division tech worked into the early hours of Wednesday upgrading meters that would not upgrade remotely. On Thursday, the display on numerous upgraded Reino meters started to fade to the point that they were unusable and were once again placed out of service. Even using a flashlight the display was unreadable. Because of the display problem, several Reinos were placed out of service on Thursday. 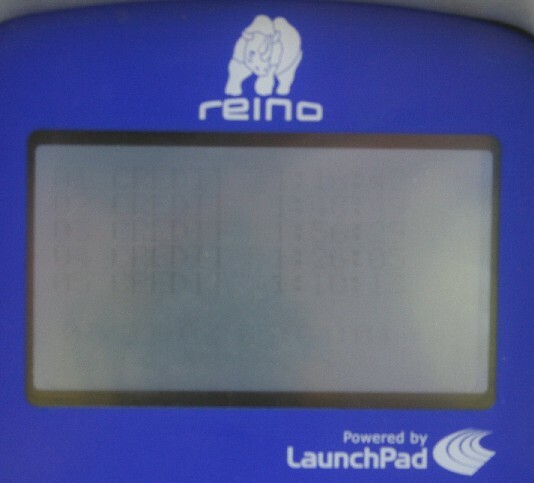 Later in the evening, technicians apparently discovered that the display settings in the upgraded Reino meters had been reset too dimly during the upgrade. The techs changed the display settings on each of the affected meters and got them back in service, but only after the city missed another evening of potential revenue. Reino meters I-101, I-107 and R-110 were currently un-repairable and the city placed them out of service for the entire weekend. They control 24 parking spaces in the second block of Rehoboth Avenue. People who park at those broken meters express concern when they read the message which appears on the meters: NOT IN SERVICE; TIME LIMITS ENFORCED - TICKETS WILL BE ISSUED. Once the meter has been placed out of service, the visitors typically cannot tell if they are in 30-minute, two- or three-hour parking areas. Somebody did note it on the meter below, but it was the only such note. 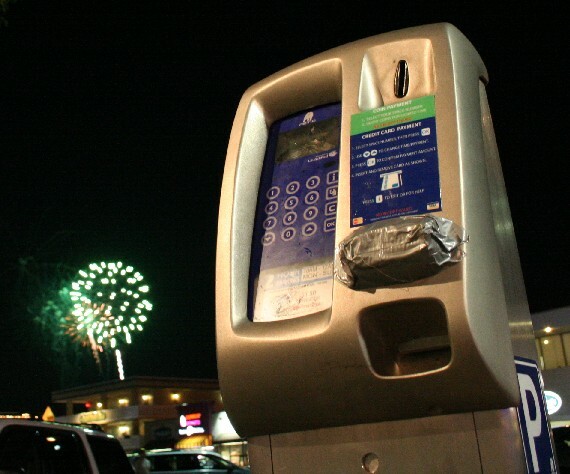 Once the fireworks ended at 9:30 p.m., crowds headed to leave town, many on the park-&-ride buses. 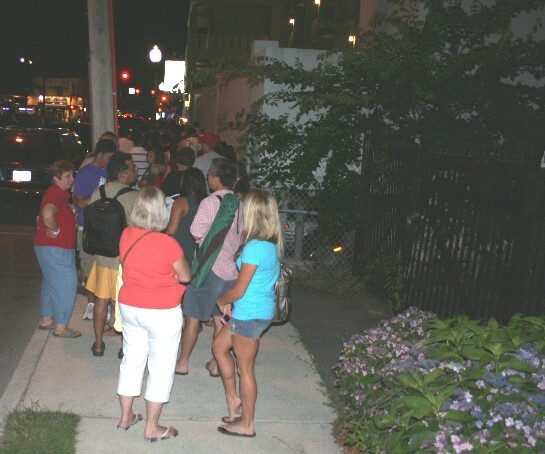 Around 10:30 p.m. the waiting line for the Rehoboth Beach park-&-ride buses extended from west of city hall, east past the firehouse to Second Street and north on Second Street to the water tank. The city's parking meter division staff helped load the passengers onto the arriving buses. Although the waiting line stretched so long, it appeared to move smoothly and peacefully. 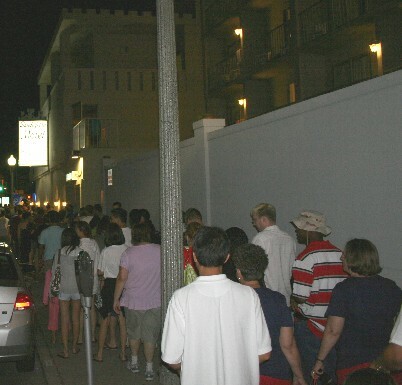 While many waited in line for a bus, others stayed for the post-fireworks concert which was well attended. 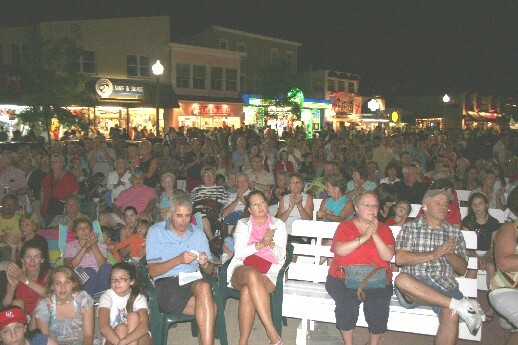 The beach was packed with almost wall-to-wall visitors at the foot of Rehoboth Avenue on Saturday afternoon. 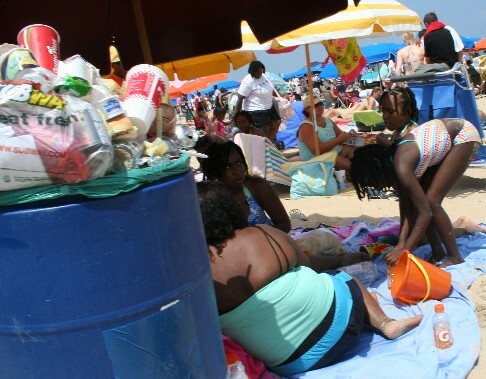 With the onslaught of visitors to Rehoboth Beach came the problem of dealing with the trash. The city manager had public works crews on the streets, boardwalk and beach during the holiday weekend to contend with the trash. The traditional mid-day July 4 beach trash pick-up was especially challenging because of the enormous crowds. A police officer was assigned to help clear the way for the tractor crew. It took them a couple hours to get through the entire 1.5-mile beach. NO FREE PARKING BEHIND REHOBOTH POST OFFICE, EVEN ON HOLIDAY! 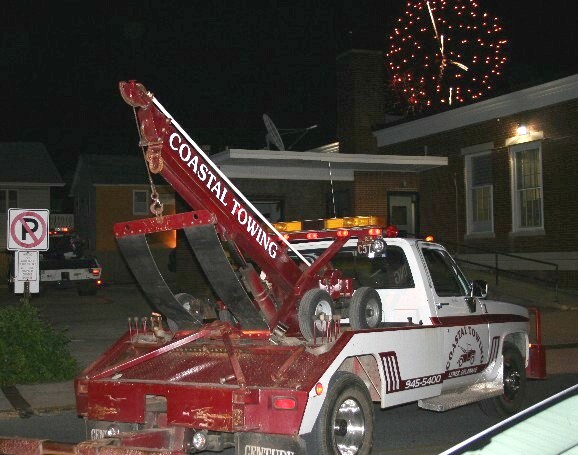 Just as the Rehoboth Beach fireworks began at 9:15 p.m., two Coastal Towing trucks descended on the Post Office parking lot, checking for unauthorized vehicles. They towed at least one. The sign reads: RESERVED PARKING FOR POSTAL EMPLOYEES ONLY - VEHICLES TOWED. 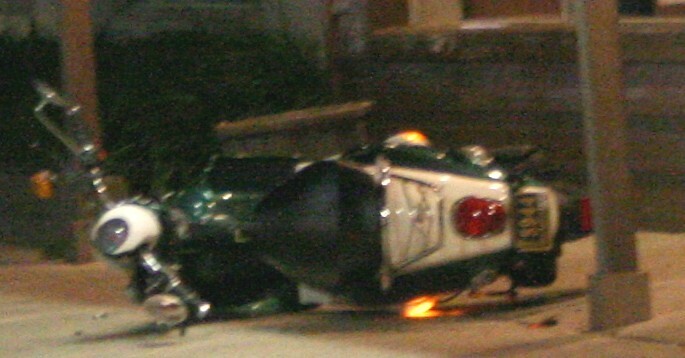 A man on a motor scooter nearly crashed into the Summerhouse Restaurant on Rehoboth Avenue around 2 a.m. Sunday. The man failed a field sobriety test, and was arrested. There were no reported injuries, and no damage to the restaurant. 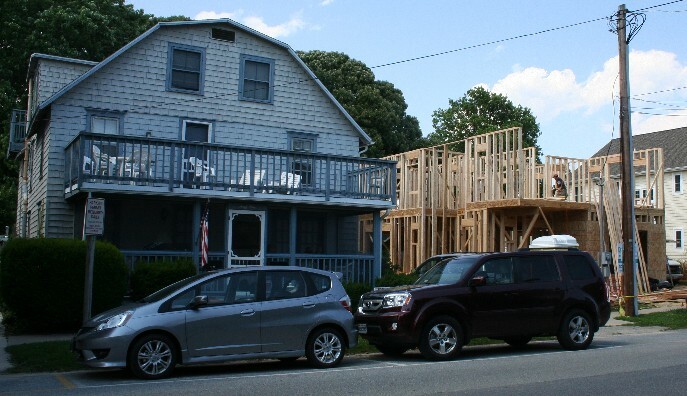 Imagine arriving for your week-long vacation in the Rehoboth Beach house on the left, and finding a house under construction right next door! The people staying here this past week were furious and said they were never warned by the real-estate agent. New tenants checked-in on Saturday and said they don't know yet what to expect. This is in the second block of Maryland Avenue. Delaware Gov. Jack Markell visited the Rehoboth Beach firehouse on Thursday to talk about emergency preparedness. He was joined by Delaware's Congressional delegation and other officials. Sen. Ted Kaufman, Rep. Mike Castle, Sen. Tom Carper, Jamie Turner (DEMA director), Gov. Jack Markell, Craig Fugate (FEMA administrator and former head of Florida's emergency management) posed for photos in front of the Rehoboth Beach firehouse. In addition to talking about emergency preparedness, the governor also signed an anti-discrimination bill while visiting Camp Rehoboth (below) and announced funding for Delaware wastewater projects while at the Delaware Seashore State Park near Tower Road. 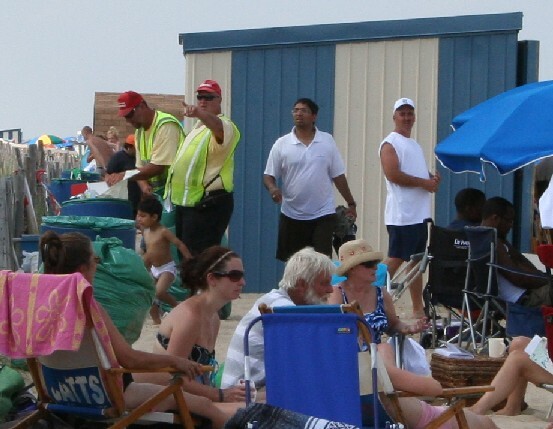 WANTED: 2 MISSING DEWEY BEACH LIFEGUARD STANDS--- The Dewey Beach Patrol stand on Dagsworthy Avenue was missing when guards reported for work on Friday. To make matters worse, the replacement chair disappeared the following day. They suspect both were pushed into the ocean. The one chair is labeled "Dagsworthy" on its rear. FISHERMAN BITTEN BY SHARK--- A 34-year-old man was bitten by a 3.5-foot-long sandbar shark. DNREC ranger Cpl. Drew Aydelotte says he was on a marine boat when he was approached by another vessel around 10 a.m. Saturday seeking medical assistance. The man onboard that boat had been fishing. He caught the shark, and while holding it by the tail to remove the hook, the shark bit him. The shark tore off about a 6x4 inch oval area of skin from his left thigh near the knee. Cpl. Aydelotte says the man realized that it is prohibited to take a sandbar shark in Delaware, so he threw it back. 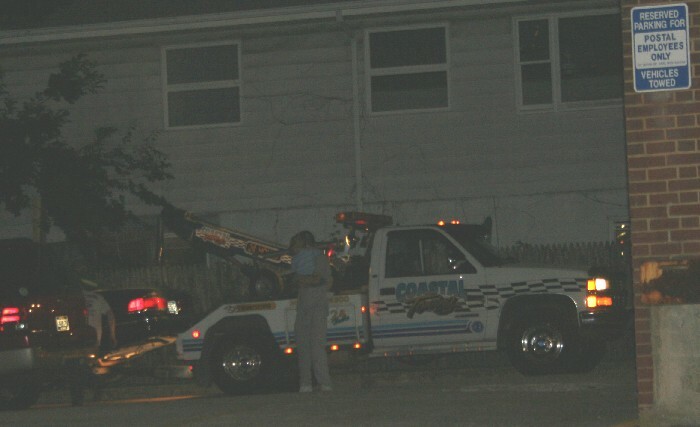 A Slaughter Beach ambulance took him to Milford Hospital from the Cedar Creek boat ramp. MAN STRUCK BY FLY-AWAY UMBRELLA--- A 54-year-old man was struck in the head by a beach umbrella while on the Fenwick Island State Park around 12:45 p.m. Saturday. 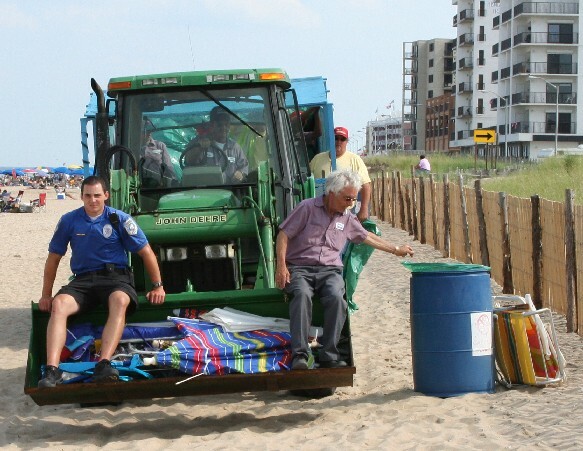 His injuries were not life threatening, but a Bethany Beach EMS crew was requested. BUSY WEEKEND FOR LIFEGUARDS --- Beach patrols along the shore were at times overwhelmed with medical calls this holiday weekend. In Ocean City, a woman injured in the surf was suffering tingling throughout her body and into her face around 3:30 p.m. Saturday. She was taken from 134th Street to Northside Park and flown to a trauma center. O.C.B.P. Capt. Butch Arbin says the guards had a busy weekend on the beach. As a result, at one point all of the city's EMS units were committed. He says the O.C.B.P. is doing spots with CBS on Tuesday and WJLA-TV on Thursday. WOMAN FALLS FROM JOLLY TROLLEY--- A 27-year-old woman was reportedly conscious but not alert after a fall from the Jolly Trolley. 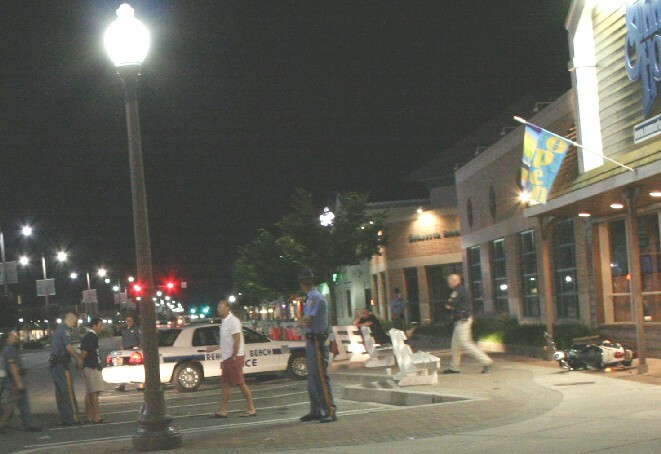 It happened around 9:40 p.m. on Thursday on Rehoboth Avenue just west of city hall. One report suggested that she was "highly intoxicated." She had no obvious signs of injury but was taken to Beebe Hospital. BOY STRUCK BY GOLF CART--- A 4-year-old boy riding a bike was struck by a golf cart. The accident happened around 7:40 p.m. on Saturday on Bayview Drive in West Bay Park. He was reportedly lodged under the front/bumper part of the golf cart. He did wear a helmet which was split in half. One radio report described him as conscious and alert with some minor bleeding when he was taken to Beebe Hospital. MAN SERIOUSLY INJURED IN FIREWORKS ACCIDENT--- A 54-year-old man was seriously injured during a fireworks accident. It was reported around 9:25 p.m. on Saturday on Fairway Lane near Millville. He was attempting to set off a large mortar round when it tipped over while he was about 10 feet away. The round struck him in the face, and seriously injured his upper lip and upper gum, knocking several teeth out of place. He was taken to Peninsula Regional Medical Center. MORE GRAFFITI REPORTED IN DEWEY--- Police on patrol in Dewey Beach Friday afternoon say the word "HAVOK" appears on several signs and various surfaces in the area of Bayside Court and Rita's Water Ice. VIOLENT ROBBERY IN NORTHBEACH PARKING LOT--- A 30-year-old man was beaten and thrown to the ground as he attempted to enter his vehicle in the Northbeach parking lot around 1:20 a.m. on Saturday. Police captured a possible suspect about 10 minutes later. They did not say over the radio what was taken. REPORTED ROBBERY IN REHOBOTH--- Rehoboth Beach police broadcast a lookout for five or six teen-age males wearing black clothing. They were last seen around 11:45 p.m. headed north on the boardwalk from Prospect Street after a strong-arm robbery. STATE TROOPER INJURED IN FALL--- A 38-year-old off-duty state trooper was injured when he fell while installing shutters on the second story of his house. It was reported around 12:30 p.m. on Saturday in the Long Neck area. He was taken to Beebe Hospital in extreme pain with a broken wrist, fractured ribs and other injuries. He is reportedly assigned to Troop 4 in Georgetown. COASTAL HIGHWAY PEDESTRIAN/BIKE ACCIDENTS--- A pedestrian was struck near the Sea Esta IV around 3:40 p.m. on Saturday. The victim was taken to Beebe Hospital with non-life-threatening injuries. 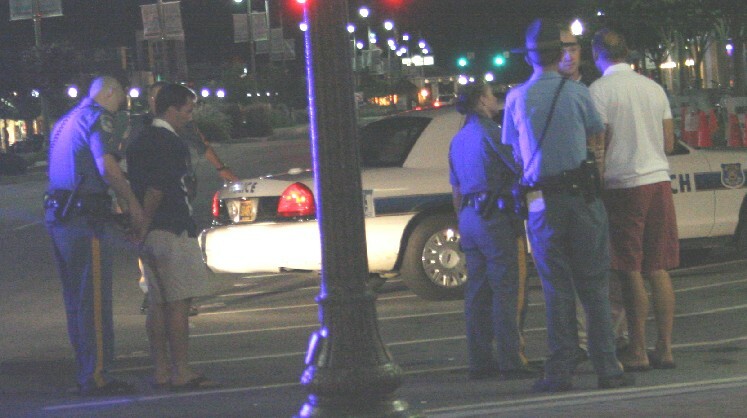 Around 1:15 a.m. Sunday, a pedestrian was hit near Dagsworthy Avenue in Dewey Beach. The 27-year-old man told paramedics he did not remember what happened, and he had consumed an unknown amount of alcohol. He was taken to Beebe Hospital. An 18-year-old bicyclist was struck by a vehicle in the southbound lanes in front of Staples near Lewes around 10:10 p.m. Sunday. There was minor damage/injury, but he too was taken to Beebe Hospital. OTHER COASTAL HIGHWAY CRASHES--- The southbound lanes were shut down around 2:25 p.m. on Friday after a wreck at Cave Neck Road. There were several minor injuries. On Saturday, a vehicle flipped over on the southbound lanes near Red Mill Pond around 8:45 a.m. About five minutes later, a Lewes fire truck responding to that accident was involved in a crash on Savannah Road (see news release below). On Sunday around 6:45 a.m., a 55-year-old male motorcyclist suffered a compound femur fracture after he crashed south of the Indian River Inlet bridge in the northbound lanes. He was flown to Christiana Hospital. WATER RESCUES--- Rescuers responded to several water incidents this past weekend. In the first, two people were reported possibly having trouble on a small vessel in the ocean off Laurel Street in Rehoboth Beach around 7:30 p.m. Friday. Firefighters were sent to investigate along with the state police helicopter crew which said "If this is your boat, they're uh, they're not in any distress. They're just sitting back letting it sail and, uh, have their legs kicked up. That's about the extent of it." Two persons on rafts were reported possibly in trouble in the ocean off the Fenwick Island State Park on Saturday around 2:40 p.m. The state police helicopter once again flew over the area. But the speculation was that the rafters had already safely returned to shore. Around 6:20 p.m. that same day, three persons were reportedly possibly in distress south of the pilot tower in the Cape Henlopen State Park. They were wearing lifejackets. They were later determined not to be in distress, but one radio report suggested they would need help getting to shore with the wind. A Carolina Skiff allegedly struck a pontoon boat and fled around 10 p.m. Saturday. The accident happened in the Rehoboth Bay near Herring Creek channel marker #1. The occupant on the pontoon boat said somebody fell from the Skiff as it fled the scene. Several agencies, including a Maryland State Police helicopter, participated in the search. No additional reports were received confirming a missing boater. On Sunday, a Russian exchange student was reportedly having trouble swimming to shore after he got caught in a rip off McKinley Avenue in Dewey Beach around 5:45 p.m. Witnesses said he appeared to be struggling as he drifted north. He was able to keep swimming until a rescuer reached him with a surfboard around 6 p.m. The Coast Guard was also involved in several other incidents (see news releases below).